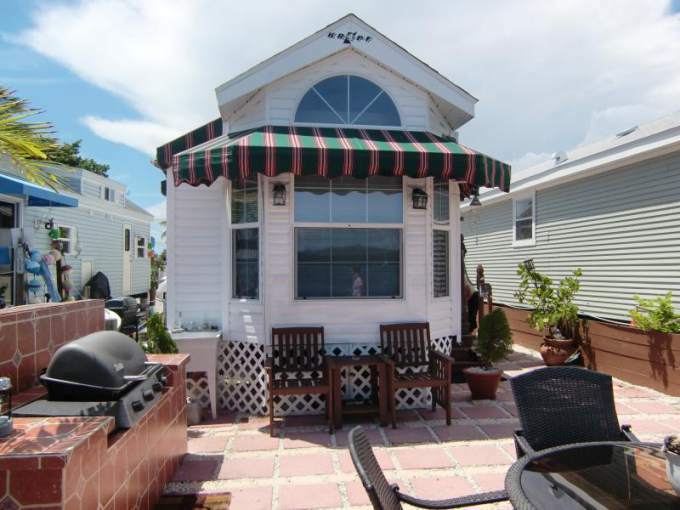 Park Model RV Homes make a perfect beach house. Their affordability, with an average price-per-square-foot well under $100, and their easy setup make a Park Model home a smart choice for a second home or vacation home. This Park Model is a perfect example of the convenience and style that can be had at a fraction of the cost of a site-built home. 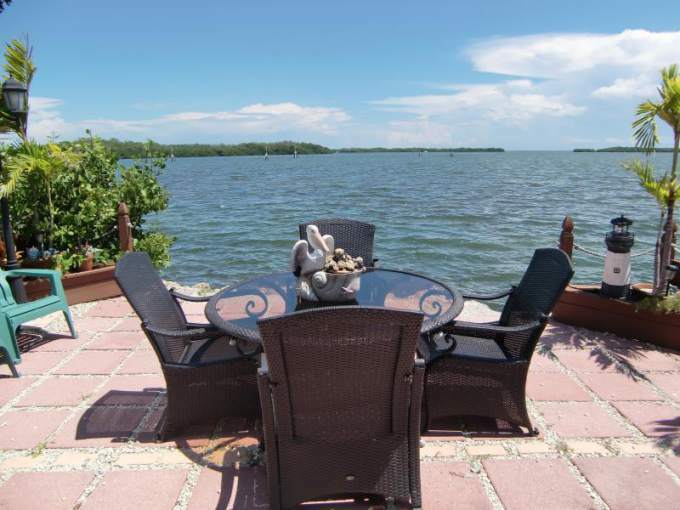 Breathtaking views of the Manatee Bay from the living room and the kitchen. 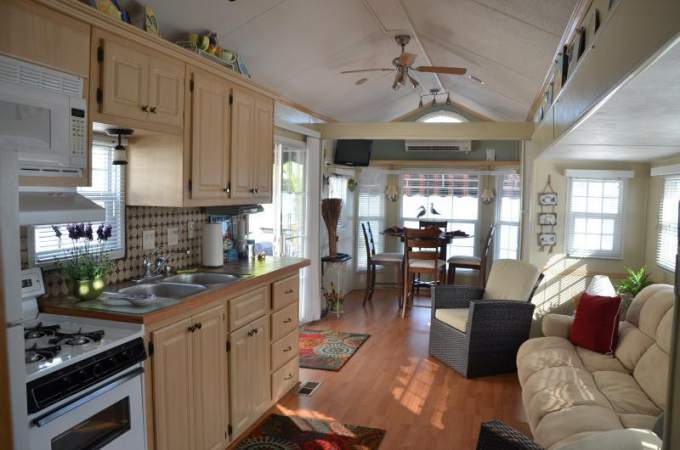 Enjoy great ocean view and ocean breeze cooking barbeque or fishing from the back yard of our mobile home. 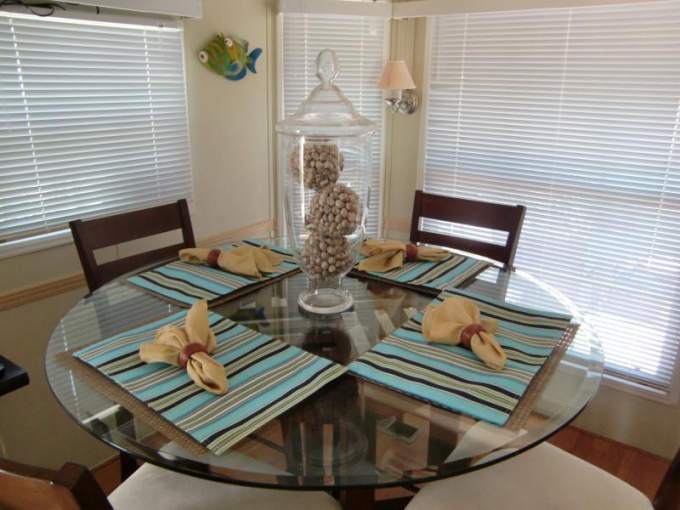 Included is the Grill (gas) barbeque outside, along with outside patio seating to relax on. Fishing rods are in the house too! You can read more about the home here. The interior of the Park Model is understated and tasteful. The color palette is varied but light and subtle, allowing the light to bounce around the space. Two colors, light sage green and cream are used throughout the living, dining, and kitchen areas. Bright white ceilings add height. Pale wood kitchen cabinets blend effortlessly into the space. 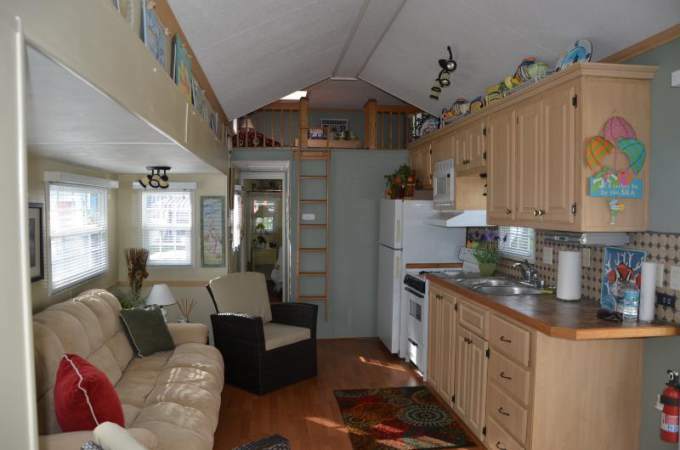 This Park Model has a layout that you often in fifth wheel campers and motorhomes. The couch is situated directly in front of the kitchen. 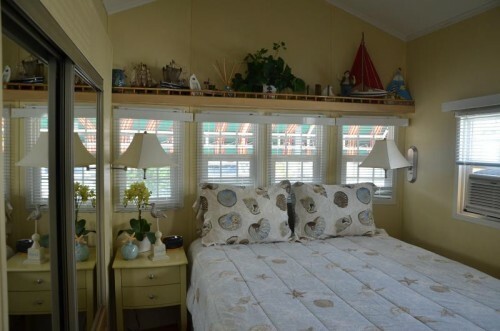 It’s a great use of space for narrow spaces. The exterior is just as great as the interior! Awnings provide shade and add a great decorative touch to the exterior of this Park Model Home. 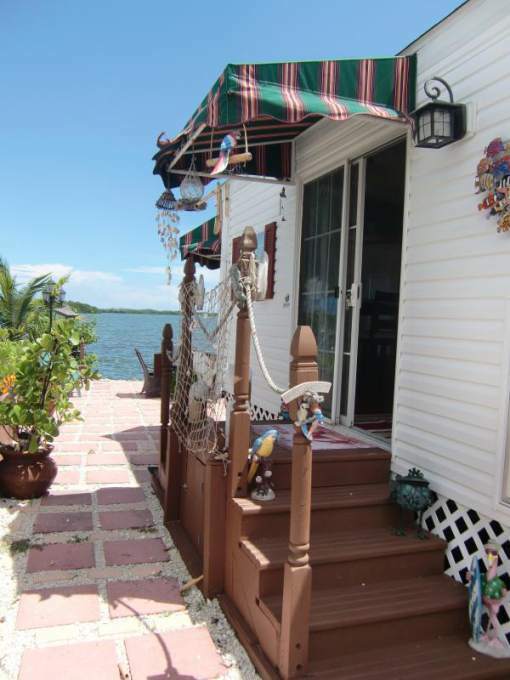 A bricked outdoor space is perfect for a waterfront property. A spectacular outdoor dining area is the cherry-on-top! This is a great example of a stylish, affordable home. Park Models with 400 square feet or less of living space are usually classified and taxed as a recreational vehicle throughout the nation. Most states limit their use to campgrounds or undeveloped private property. This classification makes the homes best suited for a small hunting cabin or vacation home, not full-time or permanent living. 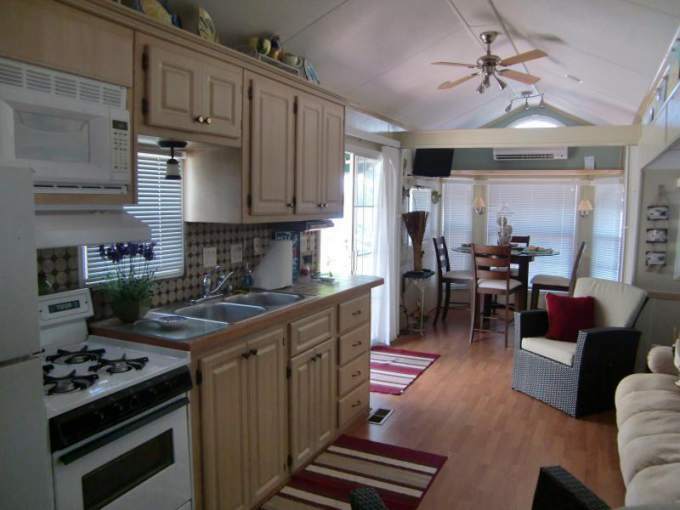 Can’t get enough of these smaller mobile homes? Check out these Tiny Home Designs That Make Downsizing Look Good and The Starfish Park Model Single Wide. Still, there’s a place for Park Model RV homes and they are catching on. It’s safe to say that we’ll be seeing lots more! I am so happy that I found your site. What an inspiration and wealth of information. I am in the process of selling my modular home and have found a mobile which I hope to purchase a little older but in good condition. I was a little leery at first but after seeing all the great possibilities I can’t wait to put my ideas into action. 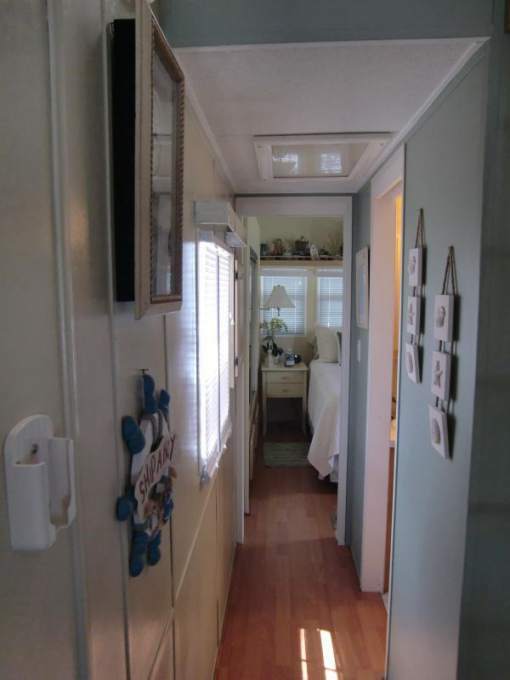 I love the mobile choice great way to downsize no more large homes for me! Thanks again! So happy to hear from you Deborah! Best of luck – I’m sure your new home will be awesome!